China Plane Skids Off Rainy Manila Runway; All Aboard Safe - Integration Through Media ....! 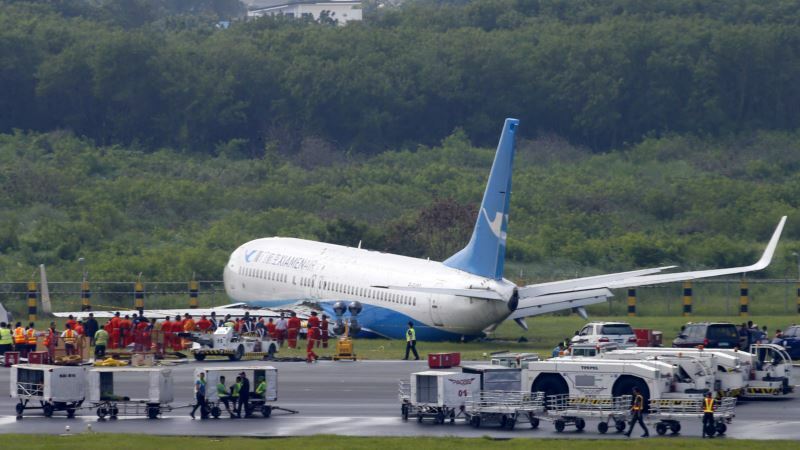 (VOA): A plane from China landing on a rain-soaked Manila runway in poor visibility veered off in a muddy field with one engine and a wheel ripped off but no serious injuries among the 165 people aboard who scrambled out through an emergency slide, officials said Friday. Only four passengers sustained scratches and all the rest including eight crew aboard Xiamen Air Flight 8667 were safe and taken to an airport terminal, where they were given blankets and food before going to a hotel, airport general manager Ed Monreal told a news conference. The Boeing 737-800 from China’s coastal city of Xiamen at first failed to land apparently because of poor visibility that may have hindered the pilots’ view of the runway, Director-General of the Civil Aviation Authority of the Philippines Jim Sydiongco told reporters. The plane circled before landing on its second attempt near midnight but lost contact with the airport tower, Sydiongco said. The aircraft appeared to have bounced in a hard landing then veered off the runway and rolled toward a rain-soaked grassy area with its lights off, Eric Apolonio, spokesman of the civil aviation agency said, citing an initial report about the incident. A Chinese passenger, Wang Xun Qun, who was traveling with her daughter, said in halting English that they embraced each other and were “very scared” before the aircraft landed in a rainstorm. She motioned with her finger how their plane circled for about an hour before the pilots attempted to land. Monreal expressed relief a disaster had been avoided. “With God’s blessing, all passengers and the crew were able to evacuate safely and no injuries except for about four who had some superficial scratches,” he said. Several international and domestic flights have been canceled or diverted because of the closure of the airport, which lies in a densely populated residential and commercial section of metropolitan Manila. Airline officials initially said the airport could be opened by noon but later extended it to four more hours. Hundreds of stranded passengers jammed one of three airport terminals because of flight cancellations and diversions. Dozens of international flights were cancelled or either returned or were diverted elsewhere in the region, officials said.